The 22% decrease in mining costs confirms the expectation that Ovoot remains at the lower end of the global metallurgical coal cost curve on a FOR China basis, the company said. The company also received the results of a geophysical survey conducted over the Ovoot tenements and surrounding areas by local Mongolian firm, AMO-Discover LLC. The survey identified two regions of interest that have been recommended for further surveying and drilling to the southwest and within existing exploration licenses. “The results of the geophysical report are positive and confirm the substantial potential to increase the existing coal resources and reserves at Ovoot,” the company said. The survey also identified areas of limited further exploration potential and the company is now in the process of relinquishing 17 000 ha. of tenement area, reducing its tenement position to about 25 000 ha. Aspire Mining is the largest coal tenement holder in the Orkhon-Selenge Coal Basin in northern Mongolia. In addition to the Ovoot project, it also owns the Jilchigbulag Coal Project and Myngan Exploration Licence, as well as a 50% stake in the Ekhgoviin Chuluu Joint Venture, which owns the Nuurstei and Erdenebulag Coal Projects. 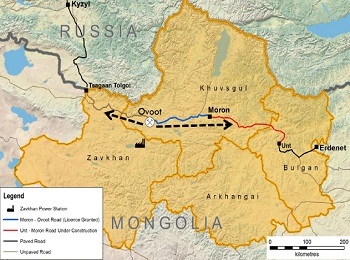 Through its Northern Railways subsidiary, the company is also developing rail infrastructure to connect its mining project to Mongolia’s existing rail network as part of a planned international trade corridor between Russia, Mongolia and China.